We all dream of that perfect hairstyle especially during the holiday season when one get invited to attend parties left and right. Alas, having that buoyant lush of hair is not possible for some due to many factors such as climate, even stress and sleeping habits, and it can really dampen one's mood especially this season. Another factor that can damage one's locks is the chemical contents of various products such as shampoo to hair conditioner and even hair treatments. Putting chemical gunk on one's hair especially with synthetic materials can really take out the natural oil and luster of your locks. Even one's diet can also affect the crowning glory so make sure to avoid overindulging in feasts this holiday season and opt for a more healthier food like fruits and veggies. And just in time for the holiday season. NOVUHAIR wants to make it a "good hair day" for its valued patrons with its Christmas Year-End Promo. 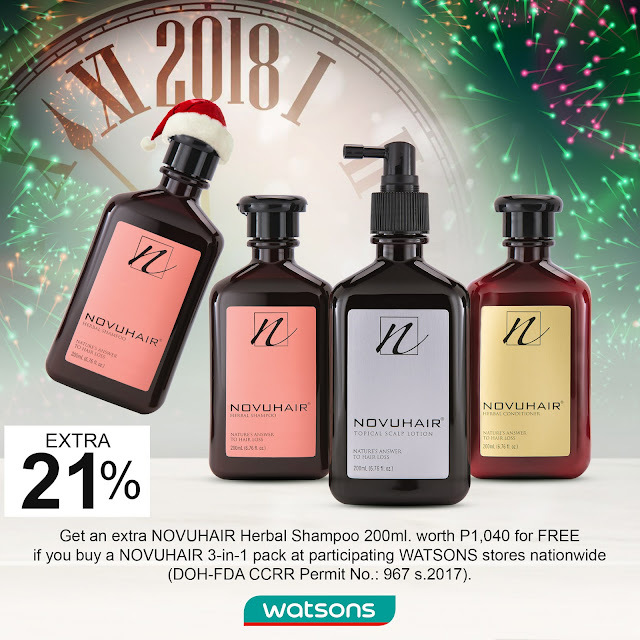 Get an extra NOVUHAIR Herbal Shampoo 200 ml worth P1,040 for FREE if you buy a NOVUHAIR 3-in-1 pack at participating WATSONS stores nationwide. NOVUHAIR is not your usual hair product because it is packed with 19 natural ingredients that includes herbal extracts and essential oils that not only help prevent hair loss but also aids in keeping it lustrous as well. It is clinically safe and proven effective. Don't miss out on this exciting Christmas and Year-End NOVUHAIR Promo. Indulge yourself or give it as that perfect gift for your love one and attain that ultimate hair styling result this holiday season.